A friend from my local writers’ group, Susie Kearsley, who writes about health, food and gardens, amongst other things, suggested I might like to participate in a ‘blog hop’, entitled ‘My Writing Process’. I’ve never done a blog hop before so it intrigued me. This one is not technically allergy related but most of what I write falls into that area so apologies for anyone who was expecting some allergy information here, but I’m hoping some of you might be interested in my writing process. I write all the time on here about living with multiple allergies and eczema which is truly my passion. If I can just help a handful of people out there not to feel so alone my job is done. It also helps me, like a kind of diary of my experiences and the things I learn – sometimes even I read back over old blog posts and relearn stuff I’ve forgotten! Sometimes I amaze myself with some of the things I write! I am also writing a regular allergy diary for the Foods Matter website here: http://www.foodsmatter.com/allergy_intolerance/ruths-diary.html which is great fun and charts the daily challenges of the multiple allergic. In my day job I work as a freelance marketing specialist and this involves a lot of writing. This week I have been writing email communications about a social media seminar and also a case study about a franchisee who has successfully opened two fitness clubs. I am also writing a blog post about testing propolis (from bee pollen) to treat cold sores which charts the life span of this latest nasty sore each day with photos to prove it! I also wrote a review of the FreeFrom Food Awards 2014 which is booming with fantastic new freefrom products which are both tasty, innovative and useful for those with allergies and coeliac disease. I love writing case studies where I get to interview the person and then catalogue their success from a basic introduction, the challenges or goals they had, the benefits they found in the solution and rounding it all off. I also enjoy writing articles about healthy living, environmental issues, foraging and eating a diet free from processed foods. I am also working on a few book ideas including a poetry book for people with allergies and eczema, a kind of life history of being on the allergic march and also a another book around the allergy theme. Creative writing is also a hobby of mine – my favourite relaxion is curl up with a pad and a pencil and write poetry and short stories. There are loads of blogs out there about gluten free living and freefrom recipes and lots written by allergy mums but there aren’t any others quite like whatallergy.com. It has been voted in the top 5 UK allergy blogs and is unique in that it’s my thoughts, rants, views and eureka moments. I thoroughly research the topics I write about so that the reader doesn’t need to trawl the internet for information like I do. I also got the chance to write a series of thought provoking short stories for The National Eczema Society last year which were both fun to do and challenging. You just don’t see characters in books, plays or stories with allergies or eczema and if you do they are usually freaks, vegans, with wormeries and strange habits. OK so I’ve love to have a wormery but I could never be a vegan. If anyone knows of a similar allergy lifestyle blogger out there I would love to meet them – blogging can be a lonely existence – you guys have no idea how lovely, heart warming and encouraging all your comments are so please do post replys and comments. I have to write. I love writing. It’s truly my passion and sometimes a curse. I always wanted to be a writer even back when I was little girl at school and then it was not encouraged as something realistic to aim for. The career advice I was given left quite a bit to be desired – I might have been post office clerk if I’d followed the advice on the neat little computer print out. I write to relax, I write to learn and share the things I learn, I write about things I’m passionate about and care about and I write as a form of therapy. Writing is part of me. I am a writer and I love it. I am pretty conscientious, I have to be. Working from home means you have to just get on with it and ignore any distractions or you don’t get paid. To be honest I have never been tempted to go and watch TV and especially not do the housework. I love working for myself and the only time that’s hard is when I’m in the grips of another allergic reaction or an eczema flare-up. I find at these times I get really depressed, exhausted and all my joy and motivation evaporates. Sometimes I am so depressed that there is just nothing there to write, but I also find that difficult times drive poems and inspire me to write things I would never normally tackle. I try to keep a journal too where I remind myself of the good things, the positive things, so even when I am at a really low ebb this can really help me find that spark again. And the good news is that all my drive, passion and inspiration comes back when I reappear again, healed, renewed and refreshed and back on track. I tend to kind of splurge it out, just write anything to get stuff on paper. Especially when I have interview notes which tend to be scrappy and unorganised. I just type, add notes, even just a word for a section I need to return to. I then print it off and go somewhere else to read over it. During the editing process I scribble out the rubbish bits and repetitive sections, add notes of where research is needed and things need fleshing out and then I go back to the drawing board. It can be frustrating process and there is a temptation to continue tweaking and editing forever but at some point the work needs submitting and I’ve never had a negative comment so I must be onto something. 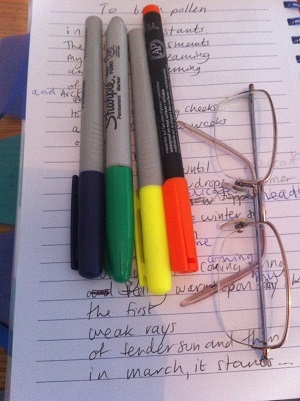 If I am really struggling I often find that writing long-hand the old fashioned way gets my creative juices flowing. My favourite places to write are in my wild garden with the bumble bees (weather permitting), in coffee shops and on train journeys. I NEVER leave home without a pad and pen, preferable many different colour pens. I write notes all the time, begin poems and have ideas popping to my head at inconvenient times so this way I can capture them and return to them later on.